With America Is Hard to See, the exhibition inaugurating its luminous new Renzo Piano building, the Whitney has reclaimed its role among the city’s museums as the engine of the new. The [Koons] exhibition’s historical position as the last to fill the Breuer building is a travesty, an abdication of the museum’s responsibility to balance aesthetic discernment with the forces of the marketplace. There is exactly one Jeff Koons in the current exhibition — “New Hoover Convertibles, Green, Blue; New Hoover Convertibles, Green, Blue; Doubledecker” (1981-1987), an example of the encased vacuum cleaners that helped jumpstart his career — and it is by no means singled out as a headliner. 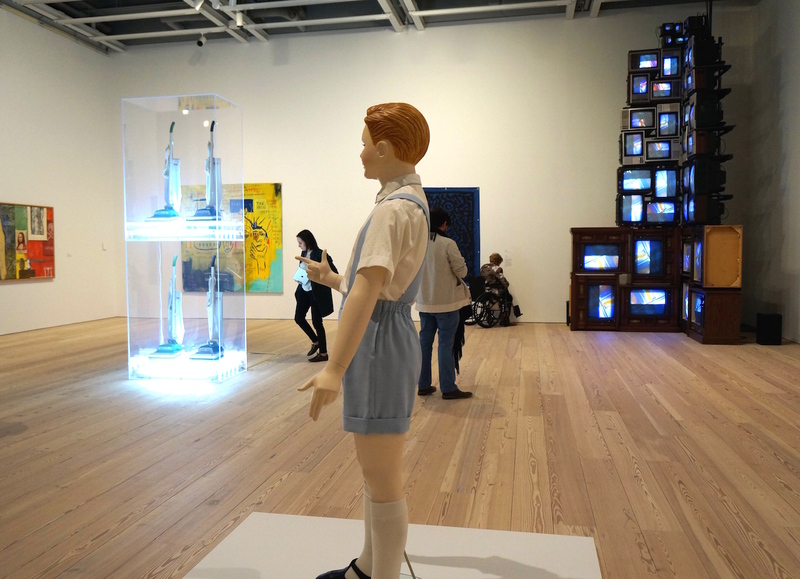 Rather, it is placed in the context of works by a diverse array of artists that includes Sherrie Levine, Barbara Kruger, Lari Pittman, Nam June Paik, Jean-Michel Basquiat, Charles Ray, Sarah Charlesworth and Jasper Johns (some hailing from the Pictures Generation, others definitely not), a curatorial move that embeds Koons’s Neo-Dada roots within a specific set of precepts that flow forward and backward in time. This continuity, spun around recycled and repurposed imagery, is signaled by the “chapter” (as the show’s thematic sections are called) titled “Racing Thoughts,” named for the 1983 Jasper Johns painting featured in the selection. The Johns — a masterpiece for a time that denies the possibility of such — connects a younger generation of artists to the history trailing from his iconic “Three Flags” of 1958 (on display elsewhere in the exhibition), which sought to return painting to everyday life through the use of prepackaged imagery. The grouping is canny and unforced — the sophistication and life experience seeping through the Johns enhance the meanings of the other works, lending layers of depth to the quotidian motifs circulating among them, while their heterogeneous explorations of recycled imagery reflect the distance that Johns himself has traveled from the simple declarations of his targets, flags and maps — and that the country has traveled from post-World War II to post-Vietnam. And so it is throughout America Is Hard to See. 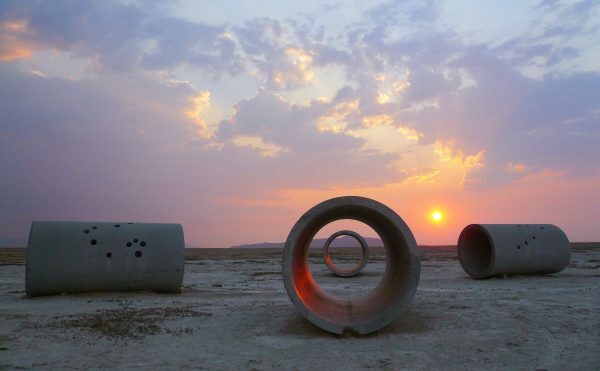 Nothing is static: artworks collide and diverge, their associations driven by their content. To base a show on what a piece of art is about rather than its chronological position or aesthetic influence is a dicey prospect, one that can reduce it to a denatured specimen of a tendency or genre. But the Whitney’s team of curators (led by Chief Curator Donna de Salvo) wisely chose to apply the exhibition’s multifarious themes to modular time frames that overlap from floor to floor (e.g., floor 7 covers 1925 to 1960, while floor 6 begins at 1950 and ends in 1975), situating formal innovations within a historical context that underscores the necessity of artistic change. 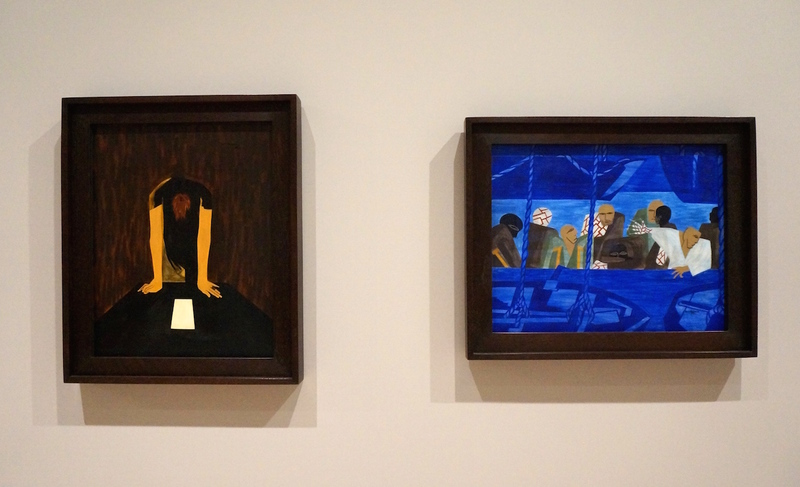 In another set of interactions, works by the perennially influential Philip Guston appear across three generational shifts: a Social Realist drawing of Klansmen, dated 1930, hangs amid politically progressive paintings by Jacob Lawrence (the great War Series from 1946-47), prints by Louis Lozowick, Hugo Gellert and Mabel Dwight, and photographs by Dorothea Lange, Margaret Bourke-White and Walker Evans; his modestly scaled abstraction, “Dial” (1956), is installed between Mark Rothko’s imposing “Four Darks in Red” (1958) and Louise Bourgeois’ classically phallic “Quarantania” (1941) in the galleries devoted to Abstract Expressionism; and a large, brooding, late figurative canvas of heads, shoes and eyeballs, “Cabal” (1977), turns up beside paintings by artists twenty-five to thirty years his junior, along with one from Cy Twombly, who was two years older than Guston, born in 1911, and one by Alma Thomas, who lived from 1891 to 1978. 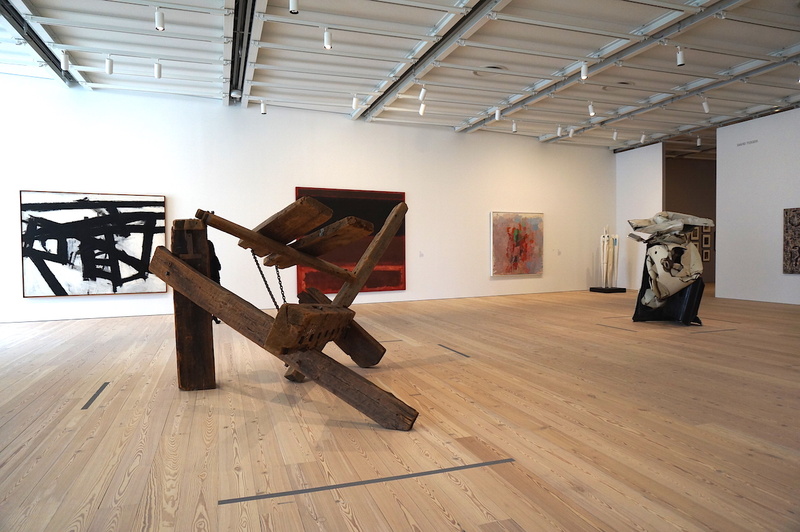 This room, titled “Threat and Sanctuary,” is devoted to the anti-formalist painting that grew, for the most part, out of abstraction but needed somewhere to go other than the psychologically fraught ethos of Abstract Expressionism. Paint-as-material (Jack Whitten, Robert Reed) and paint-as-image (Susan Rothenberg, Neil Jenney, Chuck Close) were two options, with a third being the radiant, elemental forms of Alma Thomas and Elizabeth Murray. Guston, then, like other artists in the exhibition (Edward Hopper, Georgia O’Keeffe, Joseph Stella, for starters) whose work reappears in various contexts, becomes a ligament binding together the diverse moving parts of American art. And the self-conscious use of paint by the younger artists in this room — the awareness that it is a culturally informed choice rather than a preordained tool — forms the foundation of much painting practice today. Unlike the pair of Marsden Hartley canvases that greet you as the elevator doors open on the gloriously sunlit eighth floor, “Painting, Number 5” (1914-1915) and “Forms Abstracted” (1913), whose bright colors and crisp forms feel like a clarion call for the Modern Age, the story of the seventh floor begins with a chapter called “The Circus,” after Alexander Calder’s fanciful diorama of 1926-31. “The Circus” is a reminder that American art’s romance with popular culture is nothing new, blowing hot and cold for decades. 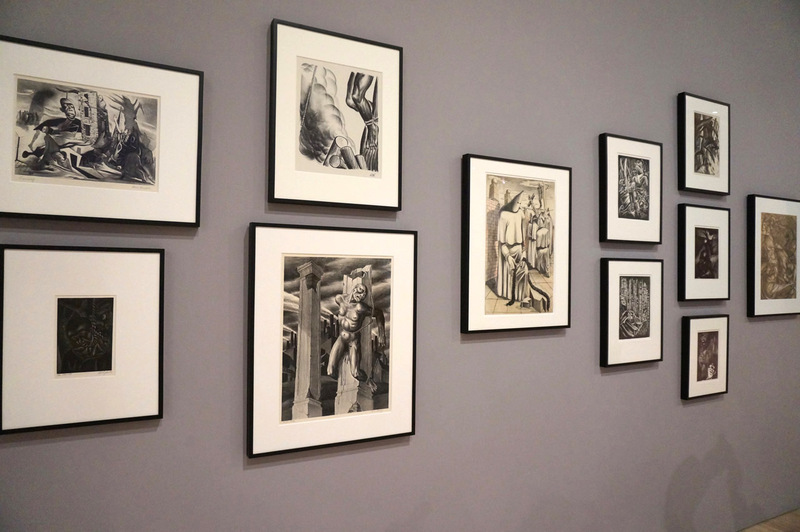 This gallery leads to “Fighting with All Our Might,” the display of socially conscious art mentioned earlier, with Guston, Lawrence, Lange, et al. If you turn to the right, you will encounter a group of Surrealist and Surrealist-tinged works by artists including Edward Hopper, Joseph Cornell, Peter Blume and George Tooker. And if you turn to the left, you will find what everyone thinks about when they think about American art — the pantheon of abstractionists starring Jackson Pollock, Willem de Kooning, Lee Krasner, Mark Rothko, David Smith and the rest of the crew. The location of Abstract Expressionism in the schema of America Is Hard to See may have been purely logistical, given the size and complexity of the exhibition. But its siting to the left of a set of politically motivated images does two things: it heralds, in emotional terms, the sense of release felt by these artists when the epiphany broke that art doesn’t have to send a message or even look like anything to be powerful, heady and enduring; and — more provocatively — it takes the first international brand of American art and shoves it to the side. By electing not to place AbEx front and center, the exhibition declares that postwar painting, rather than initiating both the American dominance of Modern Art and an inevitable march toward reductivism, is but one episode in an unfolding narrative, albeit an extremely important one, but one episode nonetheless. America Is Hard to See is an indulgent, often thrilling gift to the city that lets the art speak for itself in all its complexity and controversy, not shying away from such contentious works as Hans Haacke’s “Shapolsky et al. Manhattan Real Estate Holdings, a Real-Time Social System, as of May 1, 1971” (1971), the landmark conceptual piece that cost Haacke a solo show at the Guggenheim (and Guggenheim curator Edward Fry his job); Nan Goldin’s “The Ballad of Sexual Dependency” (1979-1996); Chris Burden’s “Shoot” (1971); and Catherine Opie’s “Self-Portrait/Cutting” (1993) among others. Walking through the show is like swimming in and out of pools of ideas, an experience both invigorating and inspiring. 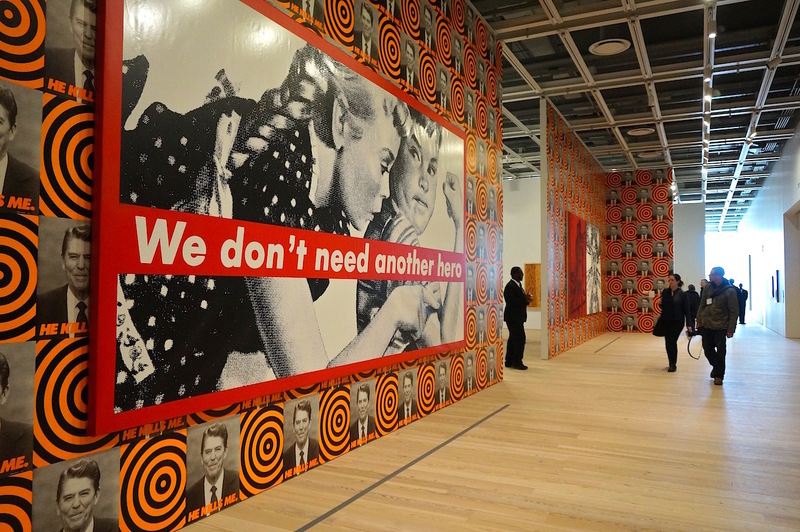 Installation view of “New York, N.Y., 1955.” The room takes its name from a painting by Hedda Sterne. The lobby of the new building contains a small gallery tucked between the staircase and the restaurant, open free to the public, which is currently featuring a show called “Eight West Eighth,” dedicated to the museum’s founder, Gertrude Vanderbilt Whitney, and its first incarnation at 8 West 8th Street in Greenwich Village (the current address of the New York Studio School, which celebrated its 50th anniversary last year). The wall text for this show states that the Whitney’s “identity and mission” from its earliest years was to be an artist’s museum, and the new space, which is simultaneously epic and human-scaled, reaffirms that mission. 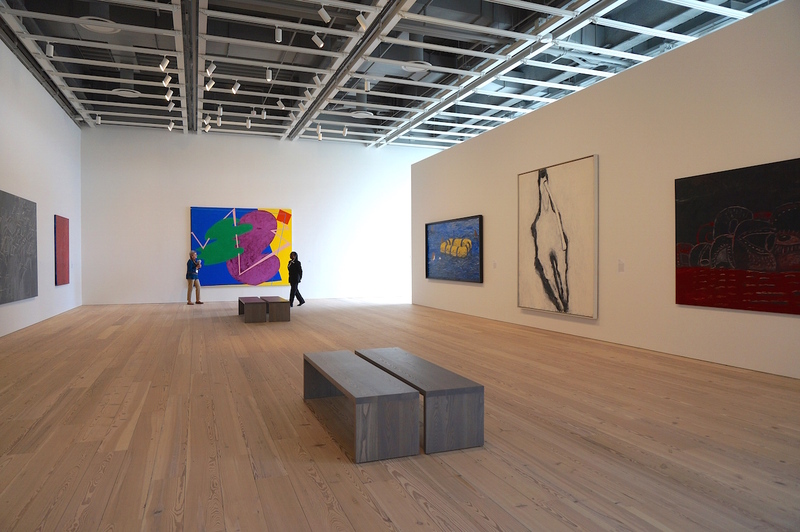 The collection’s relative lack of an international scope, which, in its uptown tenure, isolated the Whitney as a scrawny cousin to the Museum of Modern Art, the Guggenheim and the Metropolitan, has been turned on its head. With its abundantly sumptuous holdings, the museum tells us how we got where we are, offering a teeming lineage of the art of this country, primarily of this city — and for art being made here and now, there is nothing more valuable than that. America Is Hard to See continues at the Whitney Museum of American Art (99 Gansevoort Street, Meatpacking District, Manhattan) through September 27.